Growing up in Colombia, robotics teacher Javier Saavedra dreamed about becoming an astronaut despite living in a country with no space program. When Mr. Saavedra conducted a successful physics project, which sent high altitude balloons into the atmosphere to capture pictures of the earth’s curvature, it caught the attention of everyone involved plus a few SBS parents who work in the aerospace industry with ProXops. These parents immediately approached Mr. Saavedra with a new project idea to send experiments to the International Space Station (ISS) to monitor and record data from the experiments. Directed and overseen by Mr. Saavedra, alongside lower school science teacher Ana Konuma, SBS students from every school level are taking part by preparing experiments inside their classroom. Once ready, these experiments will go into a Faraday box, launch into space, meet up and attach to the International Space Station (ISS) via the Dragon. The Dragon is a module provided by SpaceX, a private aerospace company that re-supplies the space station. The astronauts will receive the Dragon capsule and connect the box to their system. From that moment on, NASA and SBS will have the ability to monitor their experiments online via a satellite-internet connection. At the conclusion of the mission, the astronauts will return the box in a capsule. Once the box is back at SBS, students will continue to analyze and learn from the experiments. Lower school students are using a Faraday box, in this case a carrier of the experiments, to measure for perimeter. When it’s up and running, they will take measurements of temperature. These temperature values will help them create a thermal graphic/heat map. 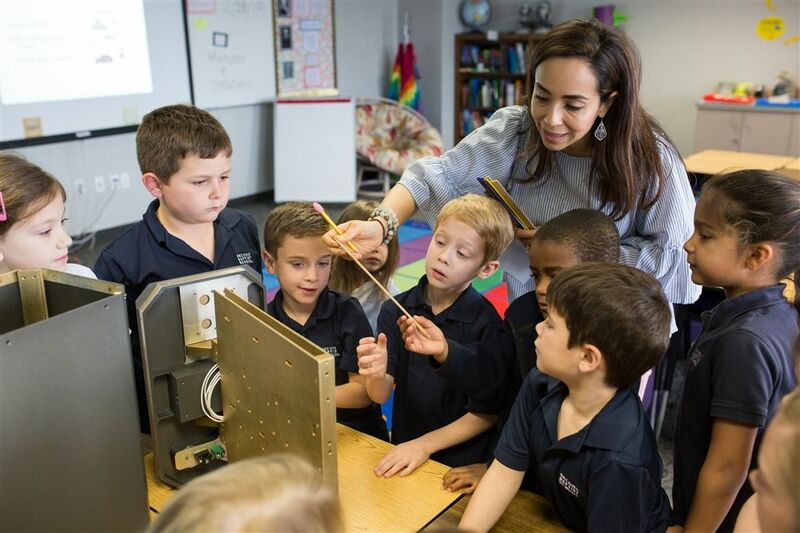 In addition, lower school students will study ecosystems—one of the experiments is watching an ecosystem in microgravity. Middle school students are preparing to send owl pellets into space so they can study bone tissue loss of calcium post mortem. IPC students will work with exposed plates that go on the outside of the space station. Each of the plates will consist of three different materials. The control will be here on earth. Additionally, middle schoolers will create blueprints for boxes that carry the experiments within the Faraday box. Upper school students will actually create the boxes from the blueprints the middle schoolers made to carry the experiments. They will also take part in experiments with the plates placed on the space station. The after school robotics students are heavily involved in the wiring of the Faraday box and are awaiting continued instruction from ProXops. The wiring is important because it will connect to the station’s ethernet so students can see results and study them. Additionally, upper school calculus students helped maximize the surface area of the exposure plates on the outside of the space station. The SBS experiments are currently scheduled to fly to the ISS in November via Space X. NASA has currently acknowledged receipt of the exposure plates (see photos of the plates HERE). At this point, the plates are going through safety protocols at Cape Canaveral. The rodent bones from the owl pellet experiments held in the middle school are now mounted on the Faraday box and ready for the mission. Mr. Saavedra created a space aquarium for the project that has been tested for integrity and will go through installation soon. This is for the lower school students to observe and study an ecosystem. Additionally, after a month of unsupervised activity, the brine shrimp in the aquarium completed their life cycle in a confined space. The aquarium now hosts animals in different growth phases! Stay tuned for more updates on this incredible learning opportunity for SBS students! Click here to view the video created for SBS students to explain Project Ezekiel.